The Veritas HPB514Ai high performance analytical balance has a capacity of 510 grams with a readability of 0.1 milligrams and an 80 millimeter round pan with automatic internal calibration. 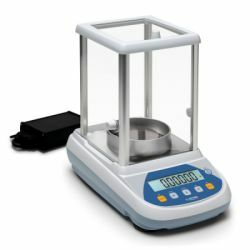 The Veritas HPB (High Performance Balance) series of analytical balances reaches the heights of measuring performance. These high performance laboratory balances are equipped with a highly integrated weighing cell that features high stability against temperature changes and time, quick response thanks to reduced mass and overall reduction of the total number of components in construction. HPB balances have, as standard, automatic internal calibration that ensures precise measurements, practically independent from enviromental temperature changes.